Click on the desired player name link in the Roster list. 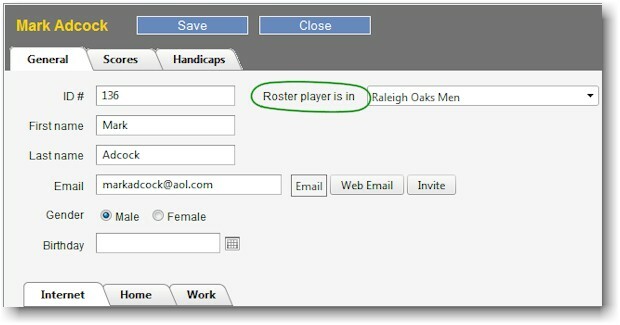 Click on the drop down menu to the right of the text, "Roster player is in:" and select the Roster in which to place this player and click the Save button. Tip: If you want the ability to place players into multiple categories, since a player can reside in only one Roster, use Miscellaneous Fields to place a player in more than one category or grouping. You can then sort a View or Report using this Miscellaneous Field. For example, if your group has outings on Monday, Wednesday and Friday of each week, you can label one of the Miscellaneous Fields "Day." For each golfer, enter an "M," "W," and/or "F" into this field. You can then sort on this field. If you have players playing from different sets of tees, you can label one of the Miscellaneous Fields "Tee." For each player you can designate which tee they play from and then sort on this field to see an alphabetical listing grouped by the tees played from.